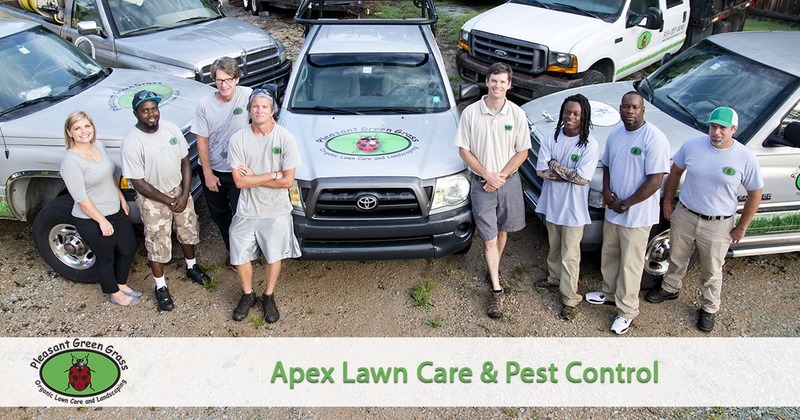 If you are looking for effective lawn care and pest control services in the Apex, NC area that are safe for your family and pets, then look no further. Pleasant Green Grass offers organic lawn fertilization and pest control services that are safe for your family and pets. Since the late 1800s, Apex, NC, remains the Peak of Good Living. But because residences continue looking their best, finding a quality lawn care service that’s available may prove tricky. When your lawns deserve the best treatment possible, you can’t depend on landscaping products. These items leave behind toxic residues that ultimately harm plants rather than help. Instead, you need Pleasant Green Grass to offer natural care services that allow your yards to thrive. We provide everything your homes needs for the best curb appeal without the chemicals! Call today for your best lawn care services. We get the results nature always intended! Whether you’re in need of better monthly care choices or you’re planning a more complicated project, our team is here for you. Call us for better lawn care and weed control, soil fertilization, core aeration services, and more! Are you planning a yard renovation project? Our experienced lawn care experts are here to assist! Call us for all your lawn care needs. We achieve better quality results than anyone else! Most homeowners agree that they would spend more time in their backyard if it weren’t for all these pesky bugs! Unfortunately, North Carolina is home to many pests that all seem to prefer backyard areas. We still offer organic solutions to all your problems. Even if your lawn stays covered in pests, we can handle it. We offer outdoor pest control for all manner of bugs. You’ll find our methods effective against mosquitos, fleas, ticks, spiders, grubs, and more! When you need the best quality of care without harming your yard, then you need us to help your lawns. Call today for the best in natural lawn care and pest control solutions! The organic lawn fertilization and pest control services we offer in Apex, NC are healthier, safer, and more effective than traditional chemical applications that are harmful to people, pets and the environment. Give us a call today and experience the difference in working with a company that cares as much about the safety of the products we use as we do for our customers.